When accelerometer-based heave units were developed, there were limited options for verifying their performance at sea with a recognised standard. With real-time kinematic (RTK) global positioning system (GPS) devices, surveyors today can achieve accuracies of 2cm in altitude measurement. With the advent of small, low-cost, low-power, micro-electrical mechanical systems being employed for motion-sensing, a compact and cheaper alternative is available to measure heave. We have verified the heave of our motion reference units at sea with RTK-GPS. ORE Offshoreadded heavemeasurement to their pitch-and-roll motion reference units (MRU) in April 2009, which use micro-electrical mechanical system (MEMS) sensors. The latter were selected for this product for their small size, low cost, low power and robust construction. Accelerometer and gyroscopic MEMS technology has been prototyped over the last eight years, and marketable gyroscopic sensors have been commercially available for about six years. Apart from extensive in-house testing at ORE, we wanted to verify the heave performance of this MEMS-based MRU at sea. Of particular interest was how the alternating current (AC)-coupled heave would respond in the field. All accelerometers and gyros (whether MEMS-based or not) are subject to noise, bias and non-linearities. There are many approaches to dealing with these issues, but all accelerometer-based heave devices tend to have a high-pass filter (HPF) effect on the final data. As the change in motion becomes very slow, these units will eventually stop responding. This has previously been referred to as AC-coupling, named after the electronics analogy of using a capacitor to block out direct current (DC) in an analogue circuit. In this case, ‘DC’ means anything generating a constant value of acceleration or velocity. This HPF result is required since even a very small amount of acceleration error will continue to affect the heave data indefinitely. To attempt to sustain heave correctly without any filtering would be equivalent to balancing a ball on your fingertip indefinitely, without moving. One side-effect of AC-coupled heave systems is that an impulse response (a motion straight up and down from the same starting point) will become translated to a sine wave with half the amplitude above zero and half below zero. This shift would be problematic if measuring this type of change on land. On the water, however, no such disadvantage is evident because (within some limits) the wave motion is generally moving above and below the intended zero point (sea level). In addition, the wave motion tends to be naturally sinusoidal rather than impulse-like. Regardless, the constantly varying amplitudes and frequencies in the ocean (the intended environment of the MRU) serve as an excellent qualification test. To qualify the effectiveness of this AC-coupled behaviour in the ocean environment, we compared the MRU heave to a reliable standard. Real-time kinematic (RTK) global positioning system (GPS) surveying has been used commercially for precision positioning for more than 10 years. This use of GPS has also been called carrier-phase enhancement GPS. To summarise this process, very accurate vertical position data is achieved by having a second GPS receiver base station on the ground, located at a well-established survey location. The difference in the GPS signal carrier phase between the ‘rover’ (actual surveying receiver) and the base station is used to calculate high-precision vertical corrections. The carrier phase data is re-broadcast from the base station to the rover, within a limited range of about 10–20km depending on environment and conditions. If the rover cannot receive this re-broadcast, it is not able to maintain fixed-station RTK-GPS quality. Using a single fixed base station, RTK-GPS can provide the roving receiver with the capability of approximately 2cm vertical accuracy. For our test we used the Trimble R7 RTK-GPS survey system. A map of Buzzards Bay (MA, USA) is depicted in Figure 1 (above), where our test was conducted. The RTK fixed base station is marked as ‘RTK Fixed Point’ on the map. ‘LOG 4 CU1’ and ‘LOG 5 CU1’ indicate the origins of the data samples described in this article. Figure 2 depicts the set-up of the testing rig. We mounted the Trimble R7 roving GPS antenna on a fixture that also held the ORE MRU and an Odom Hydrotrac transducer (SMBB200-3). We wanted all devices to be co-located on the same vertical axis for comparison testing and to perform depth correction. An Odom Hydrotrac survey-grade echosounder was used for depth measurement. Both the Hydrotrac and Trimble roving receiver electronics were located onboard the 24-foot PrivateerSea Quest. Three RS-232 serial ports connected to a laptop logged the data from each instrument, while attaching a timestamp to every data input string. The timestamp accuracy has been measured to be within 10 milliseconds between channels. The maximum rates of output data of the units are listed in Table 1. By default, Trimble R7 RTK-GPS output data has 20 milliseconds of latency. This was taken into account when performing depth correction; for comparison with straight timestamp-aligned data, it was left in. In general, there was a good correlation between RTK-GPS altitude difference and the ORE MRU heave during this set of tests. Based on the 5cm RMS heave accuracy and the 2cm RTK accuracy, error within about 7cm is deemed typical. For a large portion of the RTK/MRU data sets recorded, the averaged differences between the two data sets were in fact within 4cm. Figure 3 depicts the MRU heave in comparison to the change in RTK-GPS altitude for data sample LOG 4 CU1. We removed the average RTK altitude (about 1.5m) so we can closely compare the two data sets. The MRU shows a lack of sensitivity for higher frequency response compared with the RTK altitude. This is a result of the MRU using a low-pass (LP) filter on the raw accelerometer data to control higher frequency noise. Low-amplitude heave changes that are greater than about 10Hz in this example are not visible on the MRU record. Based on the depth correction we performed on the Hydrotrac data, the MRU heave correction was equally as effective as the RTK correction. Figure 4 depicts the Hydrotrac uncorrected depth and the depth correction made by the MRU and RTK for the same (LOG 4 CU1) data segment, both with a two-sample running average on their respective corrected depths to reduce high-frequency noise. Regarding the RTK altitude data, we removed the average depth from the uncorrected depth data so that data sets could be compared more closely. Before making this depth correction, both RTK and MRU data were manually time-aligned to the (maximum) 16 samples/second output of the Hydrotrac echosounder. The data string we recorded from the Odom Hydrotrac only showed depth data to a resolution of 0.1m, giving a ‘square-look’ to the uncorrected depth data. Despite the lower resolution, what we see is still a good indication that heave correction was performed at least as well as for the RTK-based correction. We generally experienced wave heights of between 0.2 and 0.6m with a few waves at about 1.1m. Figure 5 shows the DC-zeroed (average removed) RTK altitude and ORE MRU heave for LOG 5 CU1, where the largest wave amplitudes and greatest pitching/rolling occurred. We recorded a 27-degree roll delta within 1 second on the ORE MRU during LOG 5 CU1. While there were a few instantaneous 10–20cm deviations from some values, the vast majority of this comparison record was within just a few centimetres. This is referred to as the ‘stress test’ because it is assumed that a survey would not be conducted under these conditions in such a small boat. Despite these conditions, we believe the MRU heave performance compares fairly well with RTK-derived heave. MEMS-based motion sensors are ready to take on the challenge of motion reference at sea. 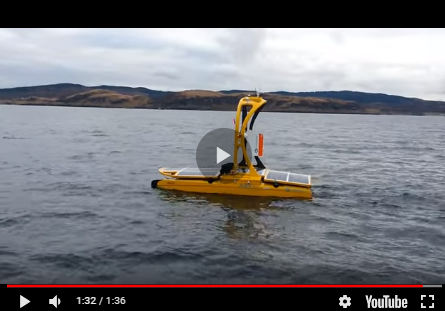 These new devices may serve as ideal alternatives when small size, low power and low cost are required, where GPS is unavailable (underwater) or where no RTK base station is within reach of radio. The author would like to thank Carl Johnsen of TG&B Marine for all his help.